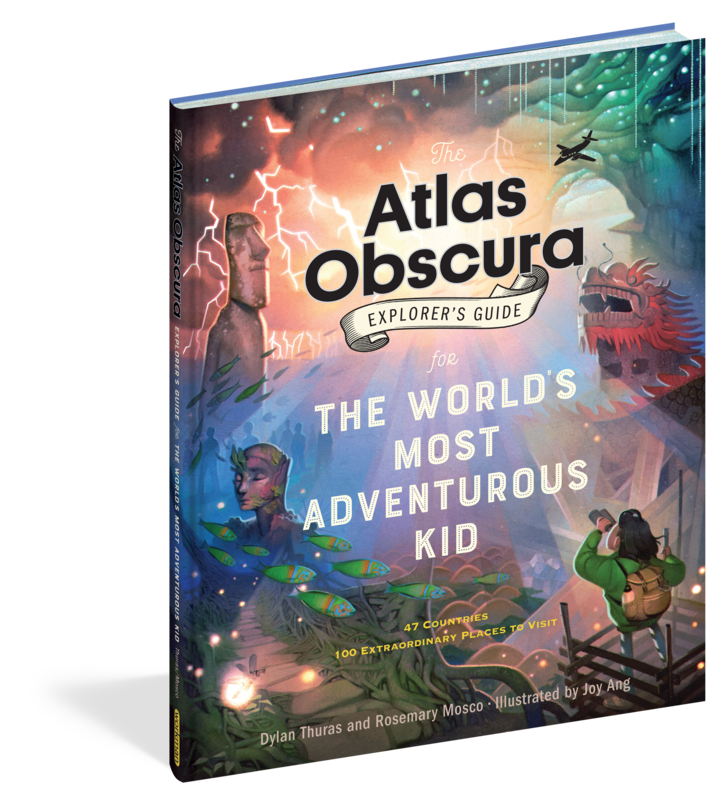 The Atlas Obscura Explorer’s Guide for The Worlds Most Adventurous Kid by Dylan Thuras and Rosemary Mosco, illustrated by Joy Ang. Workman Publishing. New York. ISBN 9781523503544 Available September 2018. Here is an incredibly beautiful book aimed at young adventurers, or even young adventurers at heart. It’s the sort of book that you will want to read with a torch under the bed covers, sprawled out in a treehouse, curled up in a window seat on a winter’s afternoon or on the grass underneath the shade of a tree. But, don’t wait for the right place. You are in the right place! This book should be read wherever you find yourself right now, at a bus stop, in the schoolyard or even at the kitchen table. The text, beautifully written by Dylan Thuras and Rosemary Mosco unfurls your imagination over 100 pages of quirky, curious places and facts hidden in the nooks and crannies of our amazing planet. At times achingly poetic descriptions of watching sunsets rise over distant forests, or lowering yourself into the centre of the earth, sits alongside thoughtful questions to ponder alongside scientific facts and details. You navigate country to country on a global romp, magically illustrated with sketches and some beautiful coloured artwork that bring an element of comic and manga epic-ness to real places, through illustrator Joy Ang. You are encouraged to emerge from the pages with eyes wide open to the possibility of discovering this fascination around you. Be prepared to find your own way! Reading this book reminds me of the thrill of the first time reading a choose your own adventure book when I was a child. For me, what makes this book stand out, is that as readers, we are challenged to find and connect the elements of wonder in the places around us now. Although the book contains just snippets of the world found in the borders and margins of places, the writers demonstrate that any two places in the world can be connected, so that you can traverse in thought from place to place. There are no photographs of the destinations included, but with the related Atlas Obscura website to explore, photographs really aren’t needed in the book. This is a book to read if you are a kid, aimed at ages 8-12, but also a book to read if you forgot or refused to grow up. A digital review copy was provided to me by the publisher and this review is also published on Netgalley.